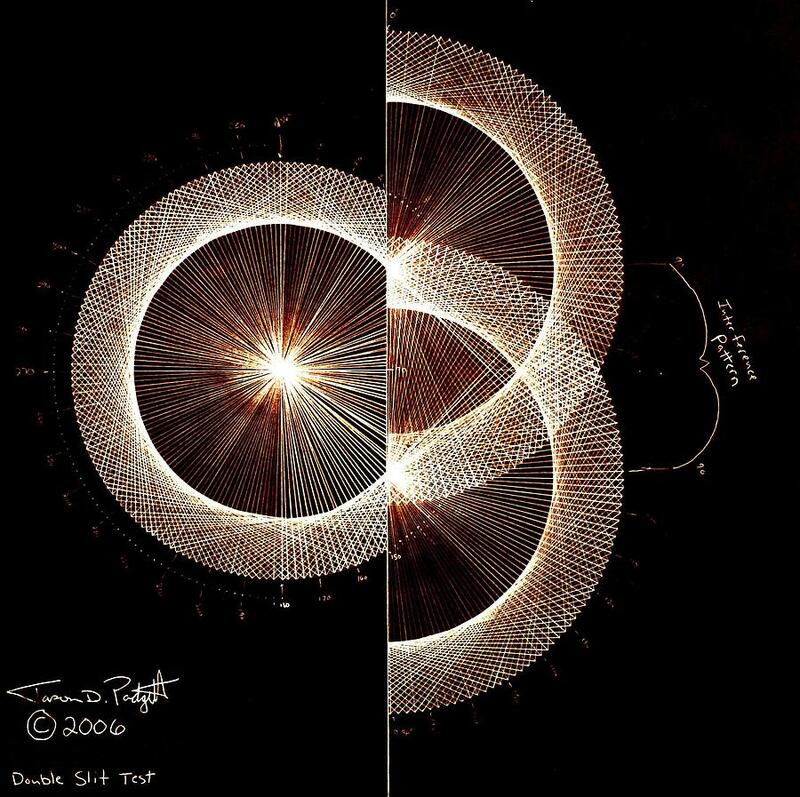 Photon Double Slit Test Hand Drawn is a drawing by Jason Padgett which was uploaded on July 15th, 2010. This drawing represents light traveling through two small slits and interfering with itself. To see this in reality, stand on a bridge and look down at waves of water interfering with itself as the columns supporting the bridge block the water at some points making the wave travel around the columns and the new waves collide. If you have a camera, take a picture of it and compare it to this drawing. It will be identical (or close depending on how far apart the columns are). Light travels as a particle (when it's being observed) and as a wave (when it's not being observed). This has been one of the beautiful mysteries of light. Since all energy travels through the quantum (I believe a Planck lattice structure). 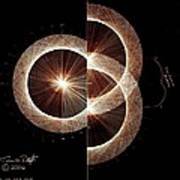 Then light does indeed travel all possible paths as quantum mechanics predicts. Light travels through (vibrates through) the lattice (or grid like) structure of space time vibrating all points connected to it. Space time is a fractal. 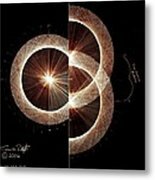 A fractal is a shape that when you decompose (or take the shape apart) into pieces, the pieces are the same (or similar) to the whole. When you decompose space time (or light) into its smallest pieces (Planck constants) the pieces are the same as the whole. When light travels, the pathways that it travels is through a lattice structure (which is also a fractal) so it's is correct to say that light travels through all fractal pathways (or as quantum mechanics says 'all possible point'). The question is, why does light behave as a particle (when you observe it) and as a wave (when it is not being observed)? Just by looking at it, you observe the point that you are looking at, so it behaves as a particle because you are DEFINING it. Light behaves as a particle when it is being observed and amazingly, JUST because it's being observed. But when it is not being observed it behaves as a wave, only because it is NOT being observed. So it appears that observation literally creates reality...another beautiful illusion of relativity. Another good way to think of it is to picture when you are sitting in your car and light from a street light comes through it to your eyes. You know how you see the little streaks of light coming off the light? Well those little streaks are going in every direction, you just see that particular streak because of your 'relative point of view'. Now imagine the same thing only this time you have a friend in the pasenger seat of your car who is looking at the same light. They will see the streaks of light going from the light towards their eyes, while you (at the same time) see the streaks of light coming toward your eyes. So the light is traveling all of those pathways but you only see a certain one because of your 'relative' point of view. When you look at the light it appears to be a straight streak of light traveling towards you but it is actually a wave traveling all directions. But your relative point of view makes it seem as if the light is a particle steaking towards you, simply because of where you are observing it from. While your friend in the car with you, 'sees' the light streak coming straight toward her because her relative position is different than yours. Now think of a billion people all around the same light post. They all will see the light streaking towards them and not towards any one else. So it gets easier to see how an individual looking at light 'sees' it as a particle streaking towards them but when you look at the light streaks from every ones point of view (or all possible pathways), at the same time, it behaves as a wave because it is traveling to all those points. It's all relative. So is light a wave or a particle? It is BOTH depending on whether it is being observed or not. The quirky, elegant, beautiful strangeness of the universe. Jason, congratulations on your sale!